A colander sits above a 5-gallon (~20-L) brewpot. The grains were mashed in the small pot while sparge water heated in the medium pot. As I mentioned in my previous article, partial mashing provides many benefits, especially for extract brewers. Procedurally, it is very similar to steeping specialty grains — you just need to hold your temperatures and liquid volumes within a certain range. 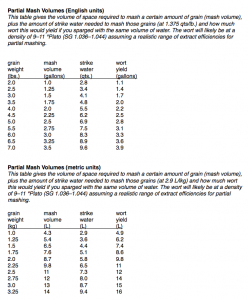 There are a wide variety of ways that homebrewers perform partial mashes. Today I’ll explain one of the most common ways for stovetop brewers to do a partial mash. All you need is a steeping bag to hold the crushed grains and a colander large enough to fit on top of your brewpot. Standard spaghetti-draining-sized colanders will fit over many pots around 5 gallons (~20 L) in volume This method works best for partial mashes with 2–4 lbs. (~1–2 kg) of grain. I’ll explain tomorrow another method for performing larger partial mashes without switching to a full-sized, homebrew mash/lauter tun. The easiest way to do a partial mash is to simply put your crushed grains in a steeping bag and “steep” them in your brewpot. At the right temperature and with the right volume of water, this is a mash. (The right temperature is 148–162 °F/64–72 °C and the right volume of water is 1.0–2.5 qt./lb./2.1–-5.2 L/kg. Let this mixture rest for 45–60 minutes. See the table below for how much volume the mash will occupy, how much water you’ll need, and how much wort you’ll yield, all based on the weight of your grain.) One benefit of doing it this way is you can heat the mash to maintain the temperature over the period it rests. You can also perform a mashout or do a full step mash, if you wanted. 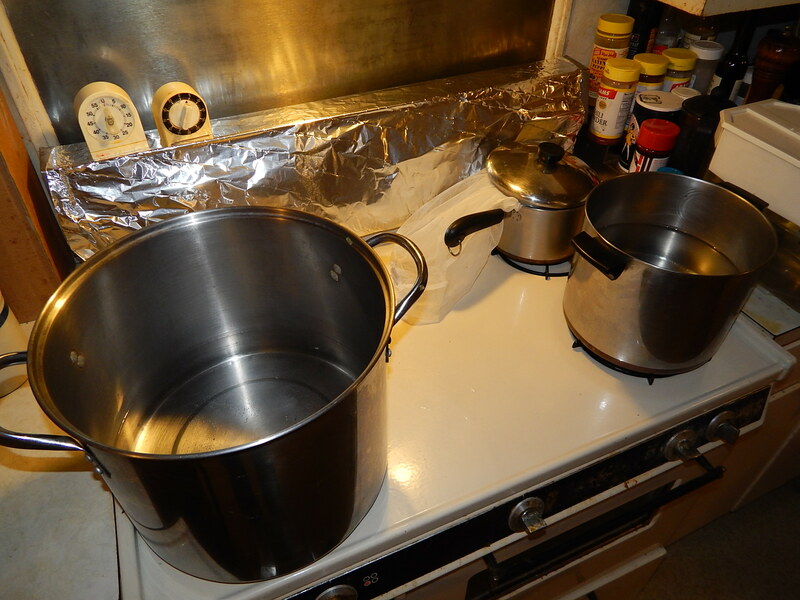 A drawback is that you can’t be heating the rest the of the water you’ll need for this batch. You can solve this problem by mashing the grains in a separate pot and heating the rest of your brewing water while the grains mash. While the grains mash, water is being heated in both the brewpot and the medium-sized pot (or hot liquor tank (HLT), in brewing lingo). When your mash is over, you can simply remove the bag and let it drip dry. This mirrors what brew-in-a-bag (BIAB) brewers do. 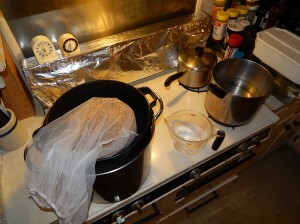 Better yet, you can place the grain bag in a colander over your brewpot and rinse the grains with hot water. (In all-grain brewing, rinsing the grains is called sparging.) Your volume of sparge water should be anywhere from one half to equal the amount of water you mashed with. The more water, the better your extract efficiency, but the more you run the risk of extracting excess tannins, especially if you rinse the grain bed unevenly or if the hot water mostly channels through the grain bed rather than trickling down around all the grains. This method works well, and doesn’t require any equipment that you likely don’t already have. All the recipes in our Easy, Surefire Extract Recipes series used this method to mash 3.0 lbs. (1.4 kg) of grain. In the next article in this series, I’ll explain a method that works better for larger amounts of grains and (if performed correctly) delivers higher extract efficiency. Click picture to expand. 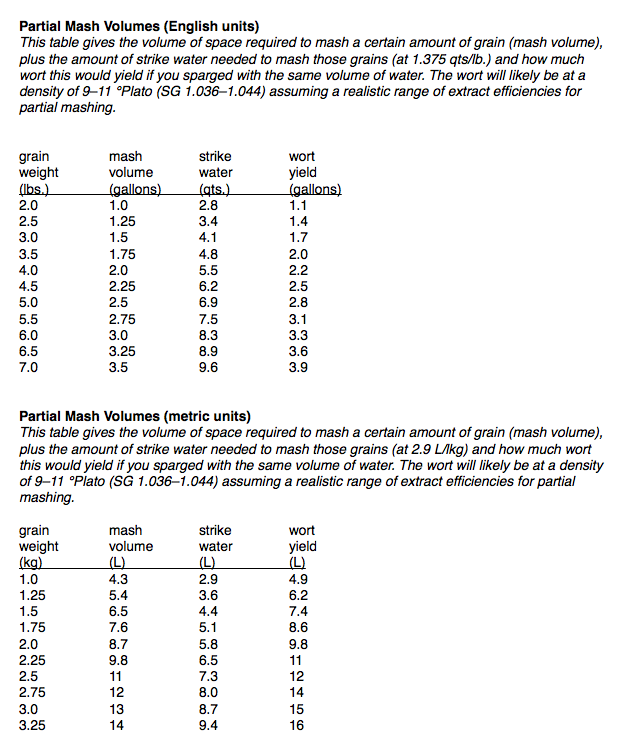 The chart gives all the relevant volumes for partial mashing, based on the weight of your grains. Did this method when I lived in a single apartment. I’d balance the colander on a hop spider to help with the space the colander would have taken up if placed in the pot. That’s a good idea if your colander extends too low into the brewpot. That’s for the information. Chris, I am a big fan of the partial mash option and have tried it with a couple of your recipes with great results. I am interested in trying an oatmeal stout using partial mash but the recipe would require mashing 5.5lbs of grain (3.5lbs specialty malt and 2lbs base malt). Since I only have a 2 gal. cooler (i.e., 4lbs of grain max) I was wondering if it is possible to steep part of this grain bill and mash the rest in the cooler. I was thinking I could steep the chocolate, crystal and roasted barley since my understanding is that roasted malts contain little starch and most of the character can be derived from steeping. I would then mash the rest (2-row, flaked oats, Victory) in the cooler. Is this a possible work-around? Yes, that is indeed possible. It’s even a good idea. I’ve made beers this way and it works great.